I mean I don’t know about you, but I can’t even get through the title of this post without busting out in song! I just love music so much and the Mamma Mia! theme song is so full of energy. You guys know I love to talk about a fun date night idea, so I could not pass this up. I was inspired by the movie release of Mamma Mia! Here We Go Again now available on Digital (and on Blu-ray October 23!) and everything else just kind of fell into place. So, lets dive in and talk about a fun Mamma Mia inspired date night with Three Cheese Pastitsio Bake. We have been watching a lot of sports lately, so it was my turn for a date night movie pick. 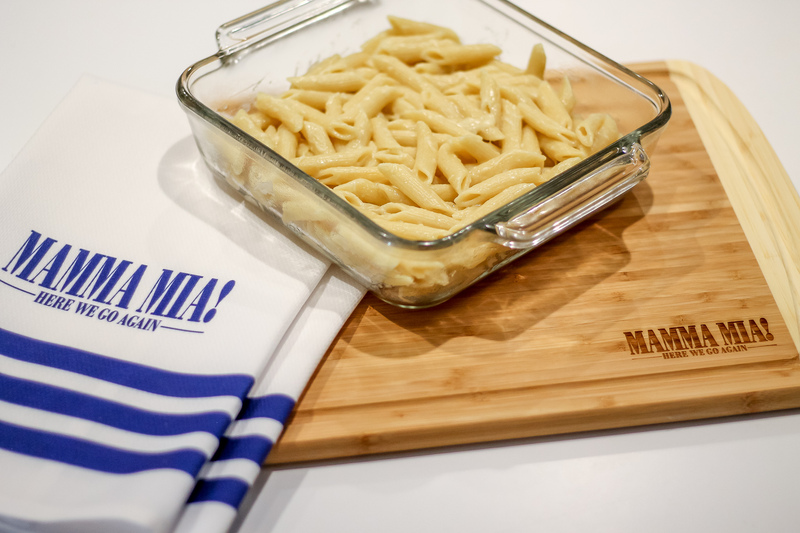 I thought, why not celebrate the Worldwide Phenomenon and Sing-Along event of the year with a savory Greek inspired recipe and enjoy it during a “Mamma Mia Movie Night In“. Once I knew the theme, the rest was pretty easy in terms of planning. I gathered a few decor items to set the mood, all the ingredients for the recipe and of course, downloaded the movie! One of my favorite things about the movie is how its so fun for all ages, the music and the vibes are just great for new romance, parents with babies or seasoned marrieds. Its upbeat and I like that for a date night. Lets talk food – because we all know good food can make or break the date night. I would suggest making this greek inspired dish together as part of the fun. Think of it as an all night activity, turned dinner and relaxation. Cook pasta until done; drain. Add in butter, shredded Parmesan cheese and Ricotta cheese. Transfer to a greased 13×9-in. baking pan/dish. In a large skillet, cook beef until it is no longer pink, breaking beef into crumbles as you cook; drain. Mix garlic/garlic salt into beef. Then, stir in the tomato sauce, salt and cinnamon; heat throughly. Spoon meat mix over pasta. Top with shredded Mozzarella/Parmesan cheese mix. In a large saucepan, melt butter. Stir in flour, salt and pepper until smooth; gradually add milk. Bring to a boil; cook and stir 1-2 minutes or until thickened. In a bowl, whisk a small amount of hot mixture into eggs; return all to pan. Whisk constantly. Bring to a gentle boil; cook and stir 2 minutes. Pour sauce mixture over beef mixture and sprinkle with remaining cheese. Once you put your Three Cheese Pastitsio Bake in the oven, you can begin the movie if you are short for time, or you can play fun game together while you wait like 20 questions. You could even put on the Mamma Mia! Music and dance along in the kitchen together. Have fun and laugh. Don’t forget, even if you don’t have time for a full meal, you can still celebrate the Worldwide Phenomenon and Sing-Along event of the year with more music and more moments when you own Mamma Mia! Here We Go Again Sing-Along Edition (Now available on Digital, and on Blu-ray & DVD Oct 23!!) But, I will say the whole greek inspired dish Mamma Mia! Movie Night In is incredibly fun!